A honey almond crust, tangy vanilla goat cheese filling, and topped with the most lucious blackberry topping. Go ahead and try raspberries, blueberries, or whatever berries you have growing near you. Line the sides of an 8-inch in diameter and 3-inch tall springform cake pan with a long 2" wide piece of parchment paper. Line the bottom with an 8" circle of parchment paper. Set aside. First, prepare the blackberry topping. Combine all of the ingredients in a small thick-bottomed saucepan and simmer over low heat for 45 min until thickened. Remove from heat and set aside to cool to room temperature. To prepare the crust, preheat the oven to 350 degrees Fahrenheit. Mix together all ingredients until a coarse dough forms. Press the dough into the bottom of the springform pan and even it out. Poke it in a few places with a fork, place in the oven, and bake for 25 minutes. Remove and allow to cool to room temperature before placing in the refrigerator to chill. To prepare the filling, mix together all of the ingredients except the vanilla bean. Then scrape the pulp of the vanilla bean out into the bowl and set the husk aside (you can discard the husk or place it in a bottle of booze to infuse it with vanilla flavor). Mix until the filling is smooth and consistent in texture. Scoop the filling into the cake pan and use a spatula to smooth out the top. 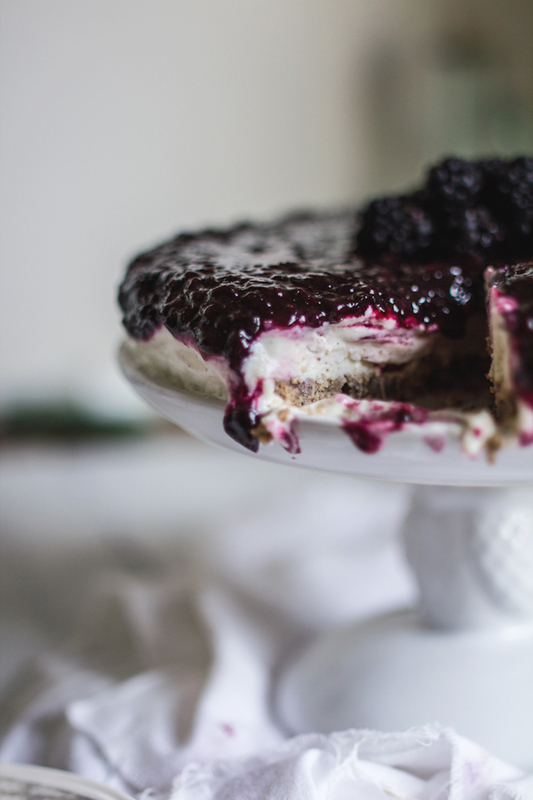 Place in the freezer for one hour, then remove it and spread the blackberry topping over the cheesecake layer. Place in the freezer again and allow to freeze overnight. Remove it from the freezer and allow to soften for 15 minutes before removing the sides of the springform pan and the parchment paper wrapping. Slice and serve immediately and freeze any leftovers.